A 41-year-old white woman presented with a 1-day history of fever to 102.6˚F and tenderness around her Hickman catheter site. The catheter had been placed approximately 3 years earlier for administration of continuous Flolan therapy to control pulmonary hypertension. No erythema or discharge was noted at the catheter site, although the patient did report intermittent diarrhea for 1 month occurring approximately 3 or 4 times per week, associated with nausea, vomiting, and abdominal soreness. Past medical history was significant for autoimmune hepatitis resulting in orthotopic liver transplant and postoperative pulmonary embolus. A physical exam revealed protrusion of the Hickman catheter 3 inches from the skin without redness or drainage. Her lungs were clear, although an S4 was auscultated on the heart exam. Bowel sounds were normal. Laboratory data revealed a white blood cell (WBC) count of 22,600. Stool studies were negative of ova and parasites. Computed tomography (CT) of the abdomen was performed to exclude possible abscess (Figures 1 and 2). 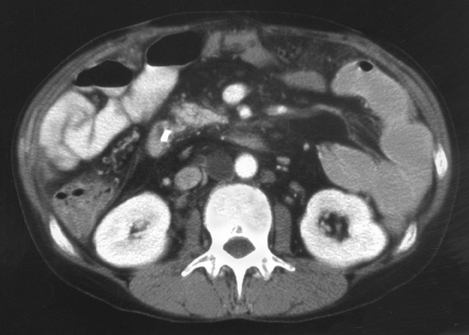 The abdominal CT demonstrates absence of the spleen and multiple rounded hypodensities in the retrocrural and aortocaval regions representing cavitary lymph nodes. 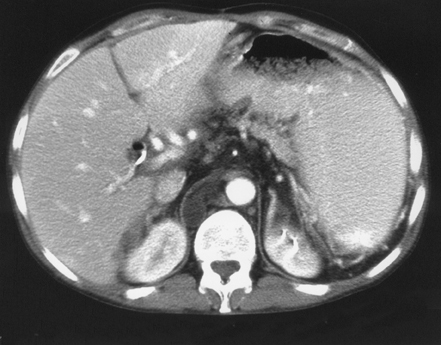 The differential diagnosis includes lymphoma, infection (Mycobacterium avium-inreacellulare), Whipple’s disease, and metastatic carcinoma post-therapy. Celiac sprue, or gluten-induced enteropathy as it is more appropriately known, is characterized by intolerance to wheat glutens. More common in women, the disease has widely variable symptomology. Clinically, the symptoms range from severe malabsorption to mild abdominal pain, though many patients are asymptomatic. The classic presentation of malabsorption and weight loss occurs in only a minority of patients. Diarrhea is the most common feature of the disease. The cause of diarrhea in celiac sprue is multifactorial, resulting from impaired absorption by the duodenum and jejunum, and net secretion by jejunal mucosa. Additionally, osmotic diuresis in the colon from unabsorbed fats contributes to water in the stool. Celiac sprue typically presents in the second decade of life. While no clear inheritance pattern has been established, the disease does occur more often in patients demonstrating the serum histocompatibility antigens HLA-DR3 and HLA-DQw2. This association suggests a possible immune reaction mediated within the intestinal mucosa. Additional hypotheses include adenovirus infection, secondary to homology of the amino acid sequence involving gluten and a viral-encoded protein. As no pathognomic clinical features exist, diagnosis is made by biopsy of intestinal mucosa. The pathologic changes are villous atrophy and crypt hyperplasia secondary to toxic prolamines. Inflammatory cells are identified within the lamina propria. Changes are usually most severe in the proximal small bowel. Confirmation of diagnosis is made by improvement with a gluten-free diet. Matuchansky C, Colin R, Hemet J, et al. Cavitation of mesenteric lymph nodes, splenic atrophy, and a flat small intestinal mucosa. Gastoenterology. 1984;87:606–614. Howat AJ, McPhie JL, Smith DA, et al. Cavitation of mesenteric lymph nodes: A rare complication of celiac disease, associated with a poor outcome. Histopathology. 1995;27:349–354.